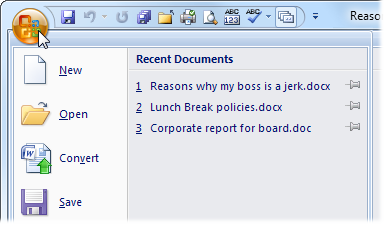 Q: When I open Microsoft Word 2007, it lists the last documents I’ve opened. How do I clear those entries? A: Microsoft Word, like many programs, keeps track of your most recently opened documents. That’s often quite handy, as you usually open the same document several times before finishing and moving on. But when you’re working on something private, how do you keep others from seeing your last-opened documents? The answer comes through a setting hidden deep in Word’s menus. Click on the Office button (shown above), and then click Word Options in the bottom of the drop-down menu. Scroll down the Advanced page until you reach the Display section. Set the value for “Show this number of Recent Documents” to 0 (zero). The Recent Documents list will be empty. To add Recent Documents back to your Word list, repeat steps above, but set the number of original documents to 5, 10, or any other number you want. Or, to keep Word from showing any recently opened documents, just leave that number set to zero. 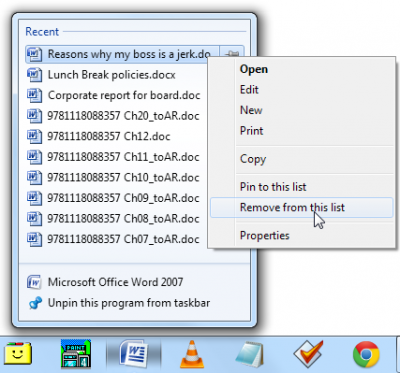 Privacy seekers will be horrified to find recently opened documents still appearing in Windows 7’s jump lists — the lists of recently opened documents that appear above a taskbar icon, shown to the left. To see any program’s jump list, right-click on the program’s icon. When the Jump List appears, click the offending item and choose Remove from this list. The unwanted item disappears, to be replaced by another recently opened item. You didn’t answer the question, how to CLEAR the documents. You just told how to set the display of documents. Change the display number back, and the recent documents are still there. I see everyone has the same answer for this question. There has to be a way to clear the cache? Otto, Windows keeps “recently opened” items hidden throughout its registry. For years, the best way to purge them was a program called MRU-Blaster. It’s a freebie, and I don’t know if the programmers are keeping it up-to-date. Give that program a try, and let me know if it works for you. I’ll update my website with your experience to help others. Hobert, check out MRU-Blaster, mentioned both in the comment above, and on this post. Thanks, I nearly got in big trouble. So I quickly searched the web and this came up. 5/5! Thank you! this was indeed useful! hi i have sent the ‘recent list’ to zero on microsoft word 2007…but the main problem is when i hit ‘ctrl + O’ to open a document on the ‘file name’ dialog box it still has the list of the documents that i had previously…how do i remove that list? Malik: I’d try MRU-Blaster, which I’ve mentioned earlier in these comments. 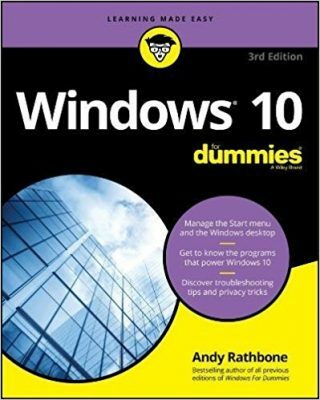 It should list the areas where Windows keeps track of previously opened documents and give you a chance to delete the ones you want.